Toulon is a human-sized, dynamic and attractive city, situated between the land and the sea in the Var Department, Provence on the Mediterranean coast between Marseille and Nice. It is the sunniest city in France with 2899 hours of sunshine on average per year, and is famous for opening out onto the most beautiful bay in Europe. Articulated around the natural harbor, the Toulon Techno Park of the Sea specializes in the fields of safety, maritime security and sustainable development based on marine and submarine high technologies. Toulon hosts a university and several engineering schools. As the main French naval base, Toulon’s military harbour shelters the major part of the Navy Action Forces. About 12,000 people work for the naval dockyards. The Toulon harbour and its deepwater quays also make up privileged places of calls for cruise ships and ferries towards the “Golden Islands” (Porquerolles, Port-Cros and le Levant) or farther towards Corsica and Sardegna. A small fishing port named Telo in the Ancien World, the city of Toulon holds a number of treasures among which some come to light when walking along the narrow streets of the lower part of the city. Most squares, shaded by plane trees or by olive trees, belong to History. The reputable provencal market named “Cours Lafayette”, a combination of colours and typical Provencal scents, is also part of Toulon’s heritage. The diversity of its landscapes (beaches, inlets, islands, mountains, gorges, lakes, rivers) and seaside resorts, villages, vineyards, historic abbeys or chapels illustrate its rich history. The Var Department is famous for its wine-making, horticultural, and botanical traditions : fine wines, olive oil, honey, truffles, figs, and chestnuts. 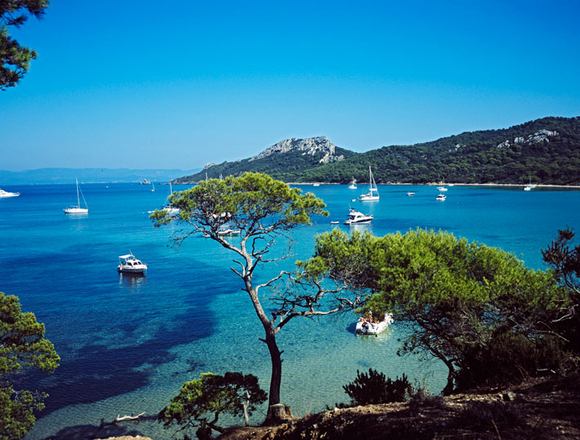 Toulon is easy to get to with three airports nearby (Toulon-Hyères, Marseille (88km from Toulon) and Nice (143km from Toulon) and a train station in the city center. Follow these links to find out more about Toulon, tourism in Toulon and the Golden Isles.